In honor of all the women and men who serve, we offer an online discount entry fee ($15 off the half marathon) for all law enforcement, emergency responders and military. Online registration opens Wed. Nov. 14, 2018 and closes Tues. Nov. 5, 2019 unless the registration limits for the marathon & half marathon are reached earlier. If the event does not sell out limited registration will be available at packet pickup on Fri. Nov. 9. The marathon and half marathon are limited to 1,500 total participants to ensure our participants enjoy a safe quality event and to meet the approval of the National Park Service. 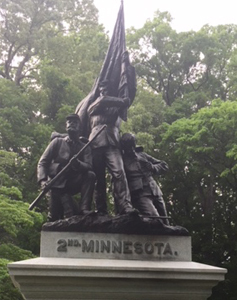 Each year the half marathon finisher's medal features a different state monument located in the battlefield. The 2019 medal will be announced later. Will this be the first time you run & finish a half marathon? If so, let us know when you sign up and we'll have a framed copy of your bib waiting for you at the finish line to commemorative your achievement. The half marathon, which starts and finishes at the 6th Cavalry museum located near the park's visitor's center, features a single loop in the Chickamauga & Chattanooga National Military Park. The mostly paved course is challenging but not extraordinarily difficult. Approximately 12 miles of the loop portion of the course winds through the historic military park. Traffic is usually light in the park. Sentries will be posted at each major turn and all turns will be marked. Each mile of the course will be marked. The course has been certified by USATF (Certification # GA08028WC). The half marathon will use IPICO Sports timing tags. Runners will receive both a gun time and chip or net time. Overall winners will be based on gun time. Age group awards will be based on net time. Results will be posted on this site as well as ChattanoogaTrackClub.org. There is a 6 hour time limit for the half marathon. Special awards will be given to the overall male and female winners, as well as the male and female masters (40+) winners, male and female grandmasters (50+) winners, and male and female senior grandmasters (60+) winners. Awards will also be given to the top three finishers, both male and female, in the following age groups: 19 & Under, 20-24, 25-29, 30-34, 35-39, 40-44, 45-49, 50-54, 55-59, 60-64, 65-69, 70 & Over. Overall winners will be based on gun time. Age group awards will be based on gun time. All finishers of the half marathon will receive a half marathon finisher's medal. Participants who complete their first half marathon at the event will also receive a special award. To receive your special first timer award, please let us know, when you register, if this is your first half marathon. Bicycles, skateboards, baby strollers/joggers, roller skates, and animals are not allowed. Headphones are strongly discouraged. The start/finish is located at the 6th Cavalry Museum in Fort Oglethorpe, Georgia (6 Barnhardt Circle). Please note, on-site parking closes at 6:45 am (EST).